The Blues are back in the Premier League for 09/10 and, living in the US's namesake, we couldn't be happier. 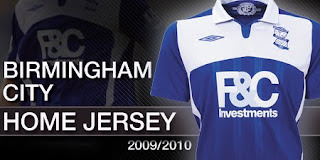 We're thus quite proud to bring out the new Official Umbro Birmingham 09/10 Home Soccer Jersey which they'll be wearing at St. Andrew's! The new shirt is predominantly royal blue with a white panel above the chest and a white collar, features Umbro's innovative Climate Control technology, a state-of-the-art fabric, which enhances the movement of moisture away from the body, allowing for increased Blues performance.